KARACHI: The Sindh cabinet has decided to rehabilitate street children. The decision to this effect was made at a cabinet meeting chaired by Sindh Chief Minister Murad Ali Shah on Tuesday. In this connection, the cabinet directed the Social Welfare Department to impose a ban on child beggary. The chief minister also directed the Social Welfare Department to launch a special drive against child beggary and also directed the district administration and police to help the department to curb child beggary and rehabilitate street children at Sweet Home and Street Children Centre Korangi. “I want to provide them shelter, food, sports activities and education so that they can become useful citizens,” the CM said. He directed Social Welfare Department to make Child Protection Authority an effective organisation. He said that an awareness drive should be launched in the media to make people aware about the Helpline 1121 to receive complaints against child beggary. The chief minister said that another effective and vigorous drive would be launched against beggary. ‘I don’t want to see any child begging at traffic signals and in streets,” he said. Advisor to CM on Law and Information Murtaza Wahab presented findings of his committee constituted by cabinet on issue of beggary on September 3, 2018. Other members of committee are Minister Health, Dr Azra Fazal Pechuho and Minister for Social Welfare Hari Ram. The committee’s report said that there were enough laws available to deal with the issue under Section 7 of West Pakistan Vagrancy Ordinance 158 that prohibits beggary. The report also mentioned that the Sindh Assembly had passed Sindh Child Protection Authority Act-2011 which called for ensuring rights of children in need of special measures and to provide matters ancillary thereto. It was also pointed out that Street Children Centre, Korangi was near completion stage. The chief minister directed Works and Services Minister Nasir Shah to get it completed on war footings. The meeting also expressed profound grief on death of two innocent children due to consumption of poisonous food. Murad Ali Shah directed chief secretary to strengthen food authority and start inspection of all food outlets. “I know our food authority is nascent but with special focus we can make it an effective organisation,” he added. The other items on agenda of meeting also came under discussion. The cabinet decided to dispose of its wheat stocks of 1,745,815 tonnes at a release price of Rs 3,315 per 100 kg jute bag. 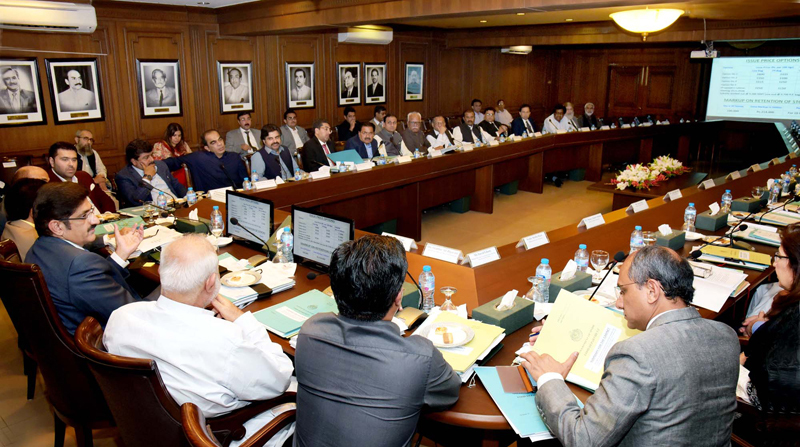 The cabinet also discussed tariff differential subsidy to Sindh New Captive Power plants (SNCPP) threadbare. Meanwhile, CM Special Assistant on Water Ashfaq Memon told the cabinet that 38 percent shortage of irrigation water for Rabi season had been declared by IRSA. The cabinet also approved amendments to the Zakat and Ushr laws.